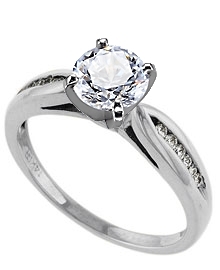 We very much liked the ring and I was very happy with the professional manner in which I was dealt with by the staff. I would go with Danforth again any day! This elegant palladium cathedral style engagement ring with tapered tips holds 12 - .0075 carat diamonds with a color of G-H and a clarity of SI. Six round diamonds are set on each side of the center diamond for a total weight of .09 carats.